Sir Benjamin Lee Guinness, 1st Baronet (1 November 1798 – 19 May 1868) was an Irish brewer and philanthropist. Born in Dublin, he was the third son of the second Arthur Guinness (1768–1855), and his wife Anne Lee, and a grandson of the first Arthur (1725–1803), who had bought the St. James's Gate Brewery in 1759. He joined his father in the business in his late teens, without attending university, and from 1839 he took sole control within the family. From 1855, when his father died, Guinness had become the richest man in Ireland, having built up a huge export trade and by continually enlarging his brewery. In numbers, sales of his single and double stouts had been 78,000 hogsheads in 1855, which he nearly trebled to 206,000 hogsheads in 1865. Of these, some 112,000 were sold in Ireland, as the rural economy recovered from the 1840s potato famine, and 94,000 were exported to Britain. By 1870, soon after his death, sales had risen further to 256,000 hogsheads, of which 120,000 were exported to Britain. Benjamin had also created the capacity for his sons to expand sales much further, and by 1879 these reached 565,000 hogsheads. As a part of the brewery expansion, and to ensure deliveries, he invested in the new Irish railway companies from the 1840s. By 1867 the firm owned £86,000-worth of Irish railway stock (worth over £135m in 2013 values, taken as a share of GDP). 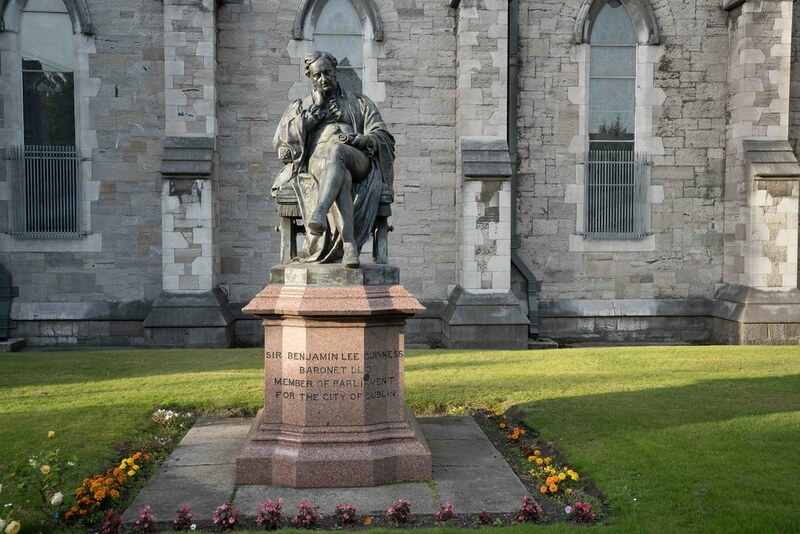 From 1860 to 1865, he undertook at his own expense, and without hiring an architect, the restoration of the city's St Patrick's Cathedral, an enterprise that cost him over £150,000. In 1865 the building was restored to the dean and chapter, and reopened for services on 24 February. 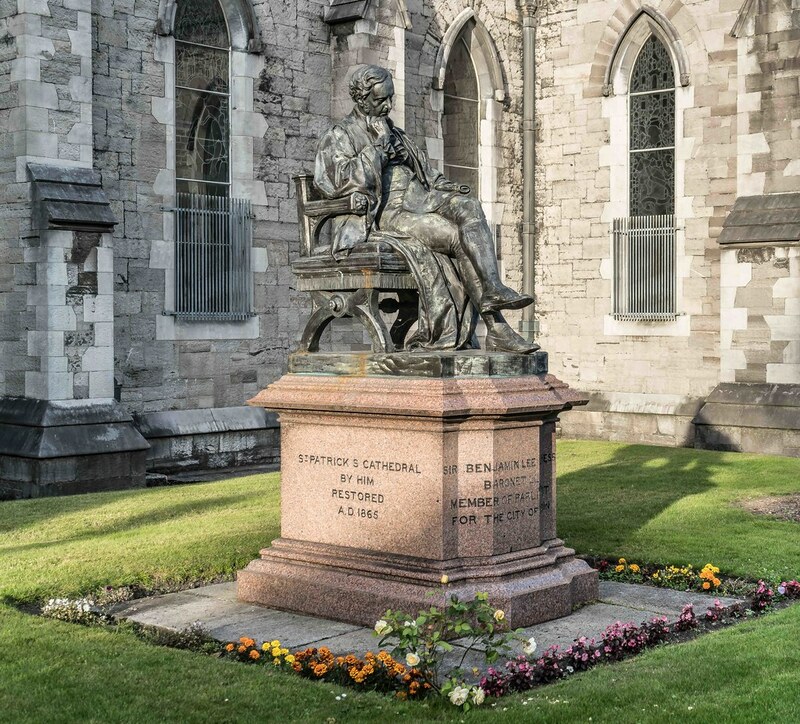 The citizens of Dublin and the dean and chapter of St. Patrick's presented him with addresses on 31 December 1865, expressive of their gratitude for what he had done for the city. The addresses were in two volumes, which were afterwards exhibited at the Paris Exhibition. In recognition of his generosity, he was made a baronet in 1867. He was one of the ecclesiastical commissioners for Ireland, a governor of Simpson's Hospital, and vice-chairman of the Dublin Exhibition Palace. He died the following year at his Park Lane London home. At the time of his death he was engaged in the restoration of Archbishop Marsh's public library, a building which adjoins St. Patrick's Cathedral, which was finished by his son Arthur. He showed his practical interest in Irish archæology by carefully preserving the antiquarian remains existing on his large estates around Ashford Castle in County Galway, which he bought in 1855. Nearby Cong Abbey was well-known, and the famous Cross of Cong had been moved to a Dublin museum in 1839.